Gizmodo called my attention to this fetching iPhone and iPad case by Moleskine. I'd been carrying Moleskin notebooks around for years -- until recently, when my little iPhone started appropriating all those tasks away from the multiple tools I carried around: pens, notebooks, GPS, calculator, iPod, camera, book, magazine, etc. I have to applaud Moleskine, which has been around for two centuries now, for finding a way to make itself relevant to the tech crowd. 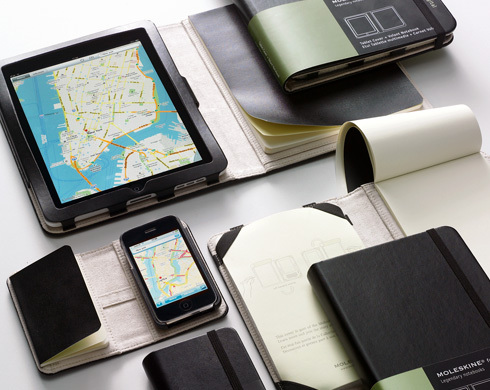 The company's proud of claiming that Henri Matisse, Vincent Van Gogh, and Ernest Hemingway were loyal Moleskin users. Who would be th e equivalent of those luminaries in the digital age? Steve Jobs is an obvious one. Mark Zuckerberg? How about David Hockney, who created the cover of this week's New Yorker using the iPad? And directly to my point, Hockney even told Bloomberg recently that "Van Gogh would have loved it!" Who says technology kills creativity? I suggest Moleskine get in touch with Hockney right away. 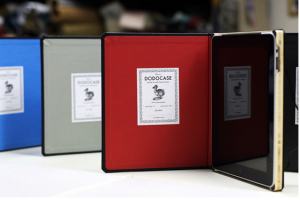 On the look out for another option, I just found this beauty, the Dodocase. Made with traditional book-binding techniques, this one cradles the iPad (they make one for the Kindle too) inside a hand-carved bamboo frame. With the cover, closed, it looks like a book. Full disclosure: I bought one.